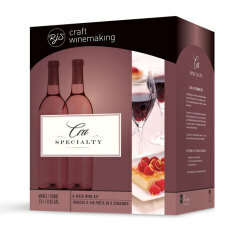 Cru Specialty wine kits offer a decadent dessert wine experience – because special meals are only complete with something sweet! Sweet, but not overwhelming, these wines pair gorgeously with dessert, but can be served on their own. Available by pre-order only, so make sure to reserve yours today! Pre-Order deadline is 8/3/2017 and delivers in October. Get energized with this coffee dessert wine, with notes of roast coffee, toffee, burnt marshmallow, and chocolate! Intensely creamy and pleasantly sweet, this red wine is sure to be hit during the colder winter months! Get lost in a forest of great taste with this full flavored dessert wine, boasting flavors of dark cherry, chocolate, plum, and toasted oak. Just like Christmas in a glass! Warm the senses with this dessert wine fit for the colder winter months. Combines the fruitiness of Raspberry with the rich flavors of mocha. Perfect for after dinner, with sweet desserts, or any time!